Portorosa is a good departure base for a yacht charter of the Aeolian Islands with a sailboat, catamaran, motorboat, powerboat or rib. Portorosa is a planned city initiated in the 1980s and 1990s that offers residences, hotel accommodations, swimming pools, and a large marina (over 600 berths). A large overlooks the marina. The marina is also surrounded by villas and a shopping area that includes restaurants and stores. 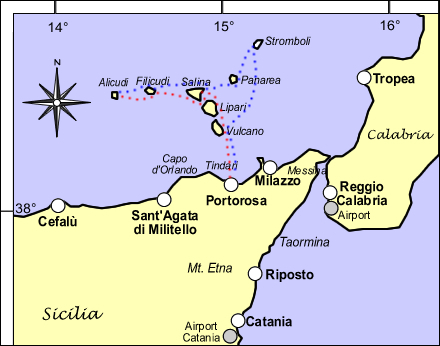 Portorosa is an ideal port for embarkation due to its proximity to the Aeolian Islands (14 nautical miles to Vulcano, 17 nautical miles to Lipari). Portorosa is 150 km from Catania (2 hours by automobile) and 180 km from Palermo (2.5 hours by automobile). Tindari, with cathedral and greek ruins, and Marinello, with coastal lake reserve, are 15 km west of Portorosa (30 minutes by automobile).